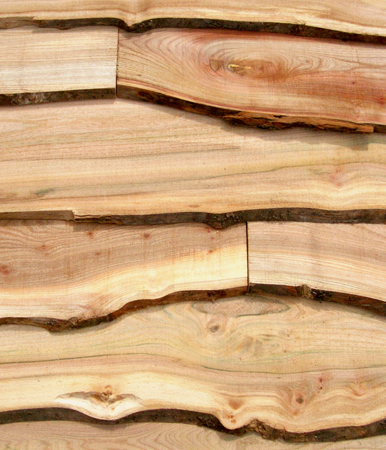 Although elm is now largely extinct in the British Isles due to Dutch Elm disease, Vastern Timber continues to maintain some of the largest stocks of logs and sawn planks in the country. 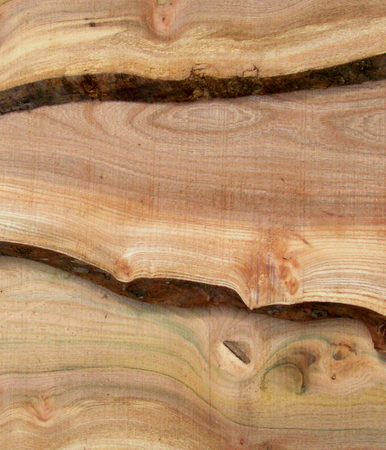 Elm is undoubtedly the most beautiful timber grown in our native forests. Its colour can range from dark purple to light green, with various hues of silver and brown in between. The grain can be wild and the cladding boards will contain various knots and burr clusters (cat’s paws), all creating a stunning finished product when used as cladding. 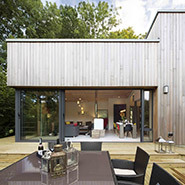 British elm cladding has long been used, especially in Wiltshire, where it was known as the Wiltshire weed. The uneven, but usually sound, edge of elm has made it a popular choice for waney-edge cladding. Elm is a particularly unstable wood and prone to distortion so care should be taken not to expose the cladding boards to excessive heat, either before or soon after fitting. Origin Legal and well-managed forests in England and Scotland. Appearance Boards will range in colour from purple to green with wild irregular grain and regular sound knots. Weathering As the boards weather the colour will change to a silver-grey. As the elm dries out the boards will shrink and are likely to distort to some extent resulting in a rustic appearance. Elm does not tend to exude any extractives such as tannin. Natural durability (EN350-2) Non / slightly durable. 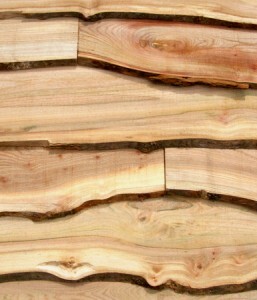 Class 4 (Although only classed as slightly or non durable, elm lasts well untreated in cladding situations. With treatment elm is found in situ more than 50 years after installation). Insect attack The ambrosia beetle can attack the wet timber (30% moisture +). However, the beetle will die as soon as the wood dries to less than 30%. Re-infestation will not occur. Other dry wood will not be affected. Sapwood can be attacked by the powder post beetle (Lyctus spp). Working properties Green elm is generally easy to work and takes fixings satisfactorily. Boards are likely to distort as they dry. Extractives Elm does not contain any reactive extractives such as tannin. We would still advise the use of stainless steel fixings.